Crystalline solar cell according to the state Department of membrane can be divided into crystalline and amorphous thin film system (hereinafter expressed as a-) two categories, while the former is further divided into single-crystalline and multi-crystalline. Silicon thin film can be divided according to material type, shape and compound semiconductor thin film of organic film-shaped, and compound semiconductor thin film is divided into non-crystalline form (a-Si: H, a-Si: H: F, a-SixGel-x: H, etc. ), Ⅲ V family (GaAs, InP, etc. ), Ⅱ Ⅵ group (Cds lines) and zinc phosphide (Zn 3 p 2) and so on. 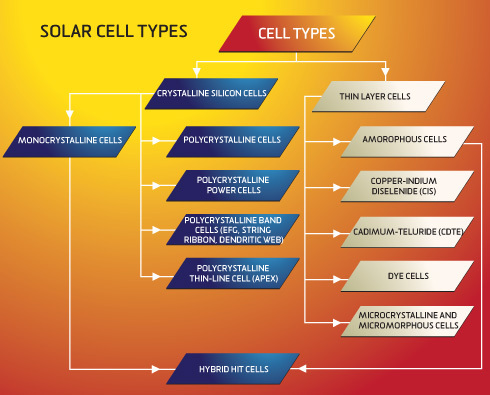 Materials used in solar cells based on different solar cell can be divided into: silicon solar cells, multi-compound thin film solar cells, polymer solar cells modified electrode layers, nano-crystalline solar cells, organic solar cells, silicon solar cells which is the development of the most mature, dominant in the application. Monocrystalline silicon solar cells into solar cells, polycrystalline silicon thin film solar cells and amorphous silicon thin film solar cells of three. The highest conversion efficiency of silicon solar cells, the most mature technology. In the laboratory the highest conversion efficiency of 24.7%, the scale of production efficiency is 15%. In large-scale applications and industrial production is still dominant, but because of the high cost price of silicon, significantly reducing its cost is difficult, in order to save silicon material, the development of polycrystalline silicon as the silicon film and amorphous silicon thin film solar battery replacements. In the solar power to dominate the market. Low cost amorphous silicon thin film solar cells, light weight, high efficiency, ease of mass production, there is great potential. However, the material is subject to the efficiency of recession caused by the photoelectric effect, the stability is not high, a direct impact on its practical application. If we can solve the stability problems and further improve the conversion rate problem, then, amorphous silicon solar cells is undoubtedly a major development of solar products. Multiple compounds as inorganic thin film solar cell materials, which include III-V compound gallium arsenide, cadmium sulfide, cadmium sulfide and copper indium selenide thin film batteries. CdS, CdTe polycrystalline thin film cell efficiency than amorphous silicon thin film solar cell efficiency, lower costs than single crystal silicon cells, and also easy to mass production, but cadmium is highly toxic, causing serious on the environment pollution, therefore, is not the best crystalline silicon solar cell replacement. Gallium arsenide (GaAs) III-V compounds, the conversion efficiency of the battery up to 28%, GaAs compound materials have very good optical band gap and higher absorption efficiency, anti-radiation ability, is not sensitive to heat, suitable for manufacturing efficient single-junction cells. But the expensive GaAs material, which largely limited the popularity of using GaAs cells. Copper indium selenide thin film battery (CIS) for photoelectric conversion, there is no light-induced recession, the same conversion efficiency and polysilicon. Has low price, good performance and simple process, etc., will be the future development of solar cells is an important direction. The only problem is the source material, the indium and selenium are relatively rare element, therefore, the development of such batteries and will be subject to restrictions. Organic polymers instead of inorganic materials is just the beginning of a solar cell manufacturing research. As the organic material flexible, and make easy, extensive source material, the cost advantages of the end to large-scale use of solar energy is important to provide cheap electricity. However, organic materials, solar cells prepared just the beginning, whether life or efficiency of the battery can and inorganic materials, especially compared to silicon cells. Can develop into a practical significance of products, but also needs further study and explore. Nano-crystalline TiO2 solar cells chemical energy is a newly developed, is that it costs cheap and simple process and a stable performance. The optical efficiency of 10% or more stable, production cost of silicon solar cells is only 1 / 5 ~ 1 / 10. Life can reach more than 20 years. Research and development of such batteries just started in the near future will gradually onto the market. Organic solar cells, organic materials that constitute the core part of the solar cells. We are not familiar with organic solar cells, which is reasonable in the matter. Now in mass production of solar cells, more than 95% of silicon, while the remaining less than 5% is made by other inorganic materials.